Event 16 of the Beech House Dental Practice TT league was a return to the Farnham-Minskip loop used on a freezing night for event 1. The weather may have been warmer but the roads had been recently surfaced dressed and so times were down. 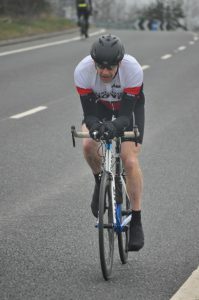 Series winner, Duncan Mullier, couldn’t resist making it ten wins in the best of nine series with 21:11, 39 seconds ahead of Nova teammate Dave Morris. Huw Spacey was third with 22:10. The women’s event was won by Alison Sarmiento in 25:07, exactly four minutes faster than second placed Jennifer Watson. The ladies title has still to be decided with both protagonists, Nova’s Corinne Mitchell and York Cyclework’s Jessica Bacon sitting this one out. Jess needs to win the three remaining events to catch Corinne. Andy Holgate took his third win in a row in the Most Improved Rider Competition, with a 25 second improvement, ahead of Richard Bellerby’s 15 second improvement. Harry Wrightson remains favourite to take the title, who’s 11 second deficit to his best was enough for third on the day and a clear lead in the Most Improved title. The final three events are all hill climbs, starting with the one mile ascent of Norwood Edge. In open Time Trials Nova’s Tony Kent recorded a season’s best 22:13 at the Bridlington CC 10 on the fast Humberside course. Walter Wilkinson, 15 mile age group record holder, Walter Wilkinson, 22:29, Chris Mawer recorded 23:12, and John Tiffany 25:20. The event was won by Pro triathlete Philip Graves of Clifton CC in an astonishing 18:35. Photo of Andy Holgate at the Nova Open in March.